Brussels – Globalization powered by technology has erased many borders but boundaries in human relationships remain, as sharp and menacing as ever. 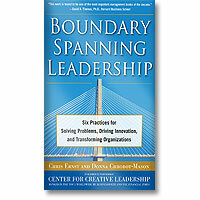 Boundary Spanning Leadership: Six Practices for Solving Problems, Driving Innovation, and Transforming Organizations, a new book from the Center for Creative Leadership (CCL), shows how to overcome these barriers, solve complex problems and drive innovation. Using a decade of global research and client experience, CCL’s Chris Ernst and co-author Donna Chrobot-Mason (University of Cincinnati), take readers from rural towns in the US, to skyscrapers in Hong Kong, from modernizing South Africa to the bustling streets of India. They offer a series of boundary spanning techniques that organizations around the world have used successfully, including Lenovo, Juniper Networks, IKEA, British Gas and Philips.